The festive season is upon us. Throughout the world, Christmas celebrations have begun with carol singing, gift shopping and twinkling lights. In honour of this festive month of glad tidings and goodwill, we thought weâd spread some awe and wonder by sharing Essential Travelâs favourite dazzling displays that pay homage to the worldâs most decorative holiday. For an extravaganza like only Brazilians know how to create, you will not want to miss Natal Luz. Their website proclaims it to be âthe biggest Christmas event in the worldâ and we find that statement hard to dispute. With the goal to âunveil the beauty and magic of Christmasâ, the festival features more than one awe-inspiring display and each is as captivating as the next. Nativitaten is the open-air opera performance on Lake Joaquina Rita Bier. Singers, joined by a choir of 100 voices, are stationed on ferries and gondolas, while flames shoot out from the water, lasers dance across the audience, fountains sketch shapes above the lake, and fireworks light up the skies from start to finish. Another display, Natalis, gives visitors a story about the creation of the world, the birth of Jesus and his greatest achievements - all told on huge screens of water. 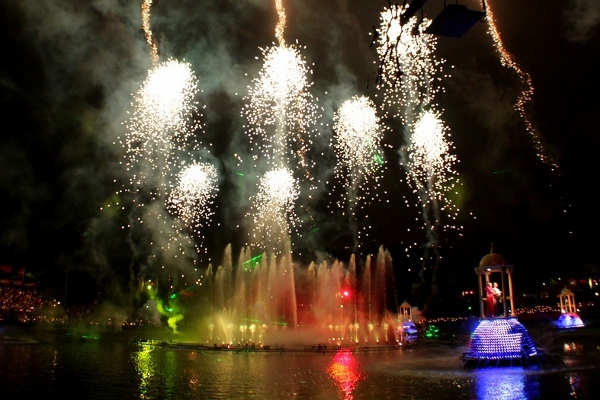 The water projections have dimensions of up to 200 square meters, synchronised with sound effects and fireworks. And thereâs the Great Christmas Parade, a two-part event, first telling the story about the birth of baby Jesus, then presenting a feast to symbolise the Christmas spirit of gathering together. There's also the daily lighting of the Christmas Tree in front of St. Peterâs Church, the Nutcracker street of giant-sized toys, the dolls and reindeer decorated around the city, and the Christmas Village. We only have one word - wow. Nativitaten opera display on Lake Joaquina Rita Bier. 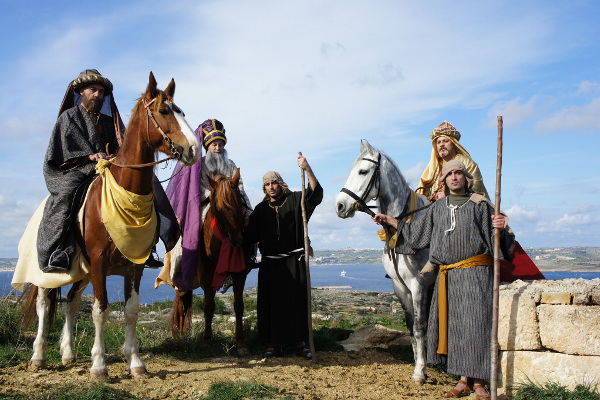 Go back in time with a trip to a small island in the middle of the Mediterranean for the most authentic Christmas display - Bethlehem fâGÄ§ajnsielem. Itâs a living nativity village like none other, reminiscent of both the event and the period that first brought the holiday of Christmas to life. 150 actors come together to provide visitors with this unique day-and-night experience of peeking into a time where horses turned mills, shepherds stayed in caves and an unknown couple brought a very special little boy into the world. There is so much to see that all visitors are given maps at the village entrance. As a non-profit event, no bookings are required and entrance is free. Leave your car at the Cirkewwa Terminal and walk up to the crib from the Mgarr Harbour, or park your car in the GÄ§ajnsielem centre and walk down to the entrance. 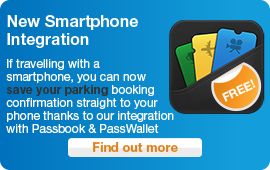 Whichever way you choose to attend, itâs well worth the journey. The Three Wise Men arrive at the village, assisted by shepherds. San Jose is home to another free event, âa two-acre holiday fantasyâ attracting over 500,000 people with more than 40 Christmas exhibits, hundreds of decorated trees and more lights than you would care to count. Skip down Candy Cane Lane, make a wish in the Candy Jar wishing well, or enjoy breakfast with Father Christmas himself. Great food, fun activities and nightly performances make Christmas in the Park an experience the entire family can appreciate. The month-long festivities also highlight the true purpose of Christmas - giving real gifts - not just the kind that comes wrapped in paper with a pretty bow on the top. A few new displays were introduced for 2013, like Santa Paws House Office where you can give the gift of a home to a cat or dog, and Environmental Alley to inspire us to give back to the planet we inhabit. 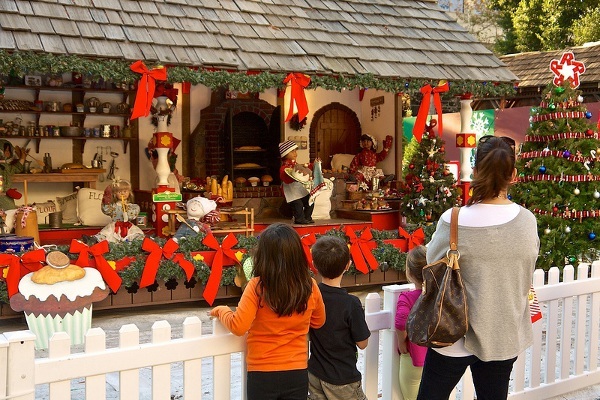 Stroll through the park to admire more than 40 Christmas displays. No one fulfills fantasies better than Disneyland, and this holiday Tokyoâs Disneyland Park will be no exception. The resort brings visitors a full range of programs all themed after âDisneyâs Santa Villageâ to delight even the grumpiest attendee. Every day, you can dance along to the festive lights and Christmas jingles of Dreamlights for which Mickey Mouse and all his Disney friends will dress up in sparkling costumes. These float parades lead straight to Santaâs toy factory, where the Disney crew help Saint Nicholas with his Christmas preparations. Once all the fun and joy has tired you out, end the day in wonder with Happiness On High for mesmerising multi-coloured fireworks. 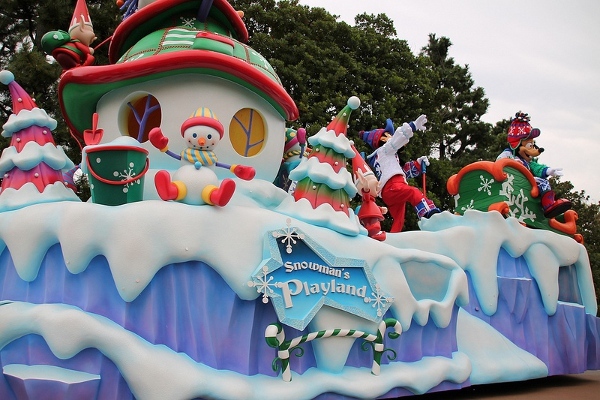 Follow the Disney floats to Santa's toy factory. Ever wondered what 1.5 million Christmas lights would look like? Thatâs right - one million! Head down under to the Hunter Valley Gardens in New South Wales for the Christmas Lights Spectacular that definitely lives up to its name. With a quarter of a million more lights than last year, visitors can expect to find 20 acres of the gardens sparkling and ringing with a variety of displays, roaming entertainment from performers and carol singers, and crowds oohing and aahing at four big Christmas trees. Open every night from 7:30 pm â 10:00 pm, except December 25, youâll have two months in which to enjoy this world-class event. 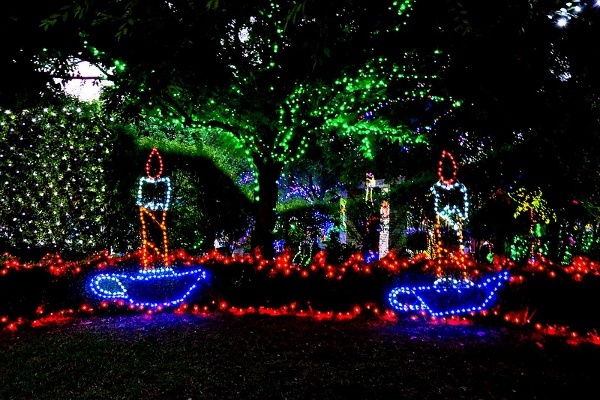 A Christmas lights wonderland at the Hunter Valley Gardens. 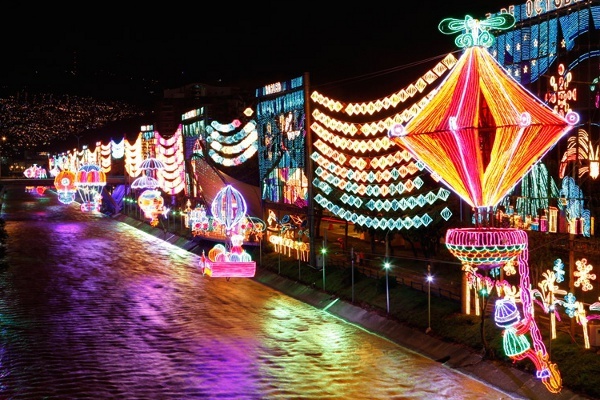 From the City of Eternal Spring comes Alumbrado NavideÃ±o, the annual Christmas lighting of MedellÃ­n. If you thought 1.5 million lights were impressive, this Colombian city will amaze you even further. No expense is spared here, so the city presents spectators with over 15 million lights in every colour of the rainbow. The entire city is adorned, from roads to parks, but the grandest display is undoubtedly found at the MedellÃ­n River. More than 1.3 miles of riverbank, plants and water is covered in light motifs designed by the neighbouring communities. Locals plan for months to create unique themes, different every single year since its conception. The festive atmosphere is kept alive throughout the month with 500 different activities, 80 Christmas events, street performers, and vendors who sell a bit of everything including beverages âof every sort and flavourâ. Some of the 15 million lights along the MedellÃ­n riverbank. 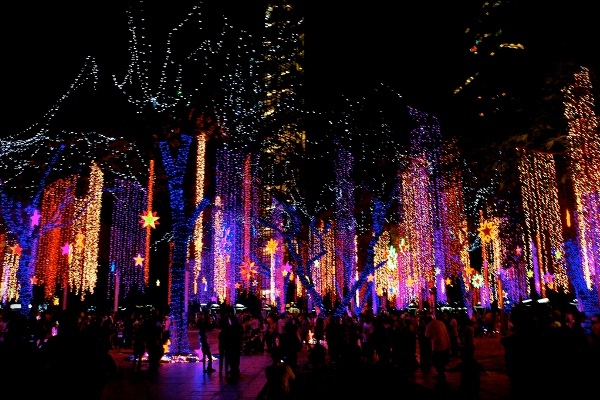 From mid-November until New Yearâs eve, every 30 minutes from 6:00 pm until 9:00 pm, stroll into the Ayala Triangle Garden for a Christmas show unlike any other on Earth. This peaceful sanctuary in the middle of a concrete jungle is transformed into a forest of lights depicting a cathedral of crystal icicles or a rainbow-coloured meteor shower. Instrumental medleys of Christmas carols and contemporary hits accompany the synchronized lighting, along with strobe lights and laser projections, while a dazzling Christmas tree watches the delight of children and adults alike. Itâs impossible to walk away from this display without a smile on your face. The colourful dancing lights in the Ayala Triangle Garden. Lithuaniaâs capital city twinkles during Christmastime with delicate white and gold fairy lights strung across streets and cascading down building fronts in the Town Hall Square. Cathedral Square hosts the Vilnius Christmas tree, voted both the most beautiful and biggest of its kind in all the Baltic states. This isnât, however, the tallest âChristmas treeâ in Lithuania. Celebrated with festive fireworks, each year the Vilnius TV Tower - 1, 071 feet tall - is festooned with garlands of lights 6 miles long to resemble the icon most representative of the season, apart from Father Christmas himself. Speaking of Father Christmas, he wouldnât miss this event and neither would his elves. They man the Christmas train that transports locals and visitors to every charming corner of the city. And once youâve explored your surroundings, head back to Cathedral Square for the 3D audiovisual projection âSounds of Heavenâ that showcase the history of Vilnius along with fascinating fragments of folklore, seasonal themes and contemporary motifs. Activities at the venue include a Christmas market, ice-skating rink and an International charity fair. Visit the Vilnius Tourism website for more information on accommodation, transport and dining options; and experience a little bit of everything with this Stebuklingos Kaledos, which lives up to its reputation for magic. 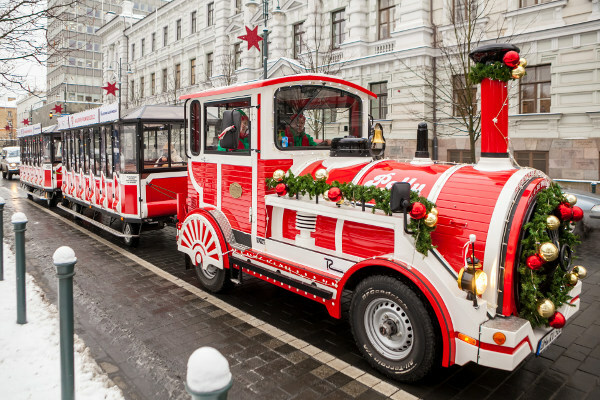 The Vilnius Christmas train with elf drivers. Come together at the Natchitoches National Historic Landmark District and do a little jig beside the Cane River lake as only country boys and girls can. Santa displays his Southern charms when the daylong pageant begins courteously with the Mrs. Claus Christmas Parade. Ladies always enter first. The official opening ceremony will then commence, unveiling many arts, crafts and food vendors to satisfy the hands and mouths of all little ones in attendance. Mid-day the Santa Claus Christmas Parade will make its way into town, followed by live music performances from two of Louisianaâs local superstars, Lainey Wilson and Frank Foster. The festival closes with a fireworks display over the Lake, tempting your return to next yearâs Christmas fun. 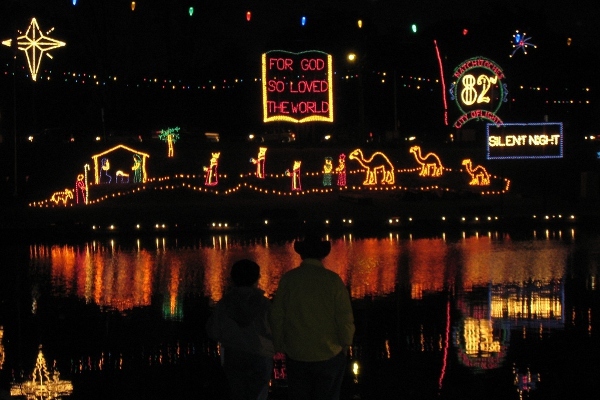 Light parade over the Cane River lake. Last, but definitely not least, something much closer to home. Join the festivities in Englandâs capital for a traditionally-themed Christmas celebration at Covent Garden. Spend your mornings shopping in the ornate Market Building that gets wrapped in thousands of pea lights and plays host to numerous âlarger-than-life baublesâ and trimmings. Then munch as you marvel at the world-famous Piazza with its enormous 60-foot Christmas tree and one-of-a-kind 15 foot topiary reindeer. Youâll also encounter live reindeer every Saturday that kids can meet, feed and pet, the âOnce Upon A Timeâ Christmas pantomime from the acclaimed theatre company Look Left Look Right, and the launch of LEGOâs first and only giant snow globe, depicting Londonâs most iconic landmarks. Witness the wonder of Christmas right here in the UK this December. 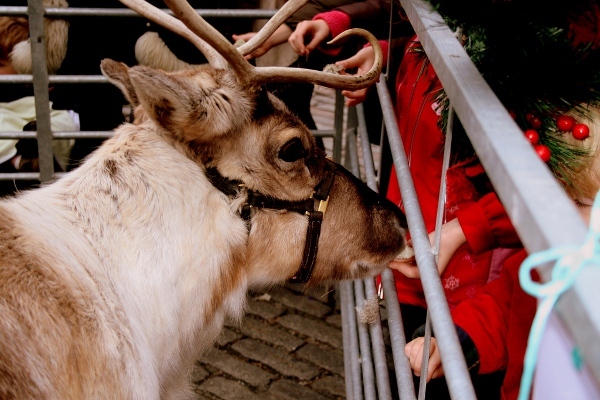 Meet, feed and pet live reindeers in the Covent Gardens. However you decide to spend this Christmas, whether youâre admiring the brightly-lit streets or buying gifts in a market, December has something to offer all people irrespective of age, gender, nationality or culture. So take the family on a trip or marvel at the wonders your own city has to offer.